When you think about it, where better could a narcissist get such a ready, biddable, vulnerable source of Narcissistic Supply than from her own children? These women have, of course, all the specific traits of Narcissistic Personality Disorder. But as mothers they have a few other tricks too, especially for their children. They fall into one of two categories - engulfing mothers who see no boundaries between themselves and their daughters on the one hand, and ignoring mothers who don't particularly even see their daughters at all, and certainly don't care. Each is hugely dysfunctional and damaging. One trick, or aspect, of narcissistic mothers, is that they're quite often nice. This can be so confusing - part of the head-wreckingness of this whole NPD. The niceness always has strings attached though. One of Narcissistic mothers' favourite tricks is invalidation, including a particularly nasty and insiduous form of invalidation called gaslighting. No matter what emotions or memories you bring up, they'll dismiss them. This leads you to not knowing which way is up. Are they really toxic, or are they right about it all being your fault? They master various forms of abuse, including forcing their children into the Golden Child or Scapegoat roles. They also can be masters at pure and simple bullying. Also, most narcissistic mothers are emotional vampires, feeding off your and others' tragedies, and always dismiss or otherwise ruin your successes and celebrations. I found therefore that dealing with my narcissistic mother involved only the most banal of conversation - I could share neither my highs nor my lows as both were used as fodder for her drama and self-centredness. 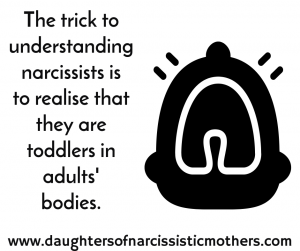 Narcissistic Mothers also have the twin cruelties of parentification and infantalisation, where they get you to parent them and keep you dependant on them. respectively. A narcissistic mother could do either or both of these. Another one of their tricks is triangulation, where they make themselves the pivotal point of the family dynamic and everything has to go through them. Add to this, you have to cope with many narcissistic mothers' extreme vanity, along with dealing with their sometimes abusive and bizarre attitude towards sexuality, and you have quite a combination. Mothers with Narcissistic Personality Disorder can't always do it alone, of course. They need help, and Enabling Fathers are the perfect ones to give them that help. For a kind of a bitter laugh, check out the Narcissistic Mothers Dictionary, and see how they use words differently from the rest of the world. And an absolute must-read is this iconic Characteristics Of Narcissistic Mothers. And, when you become a mother in your turn, and learn so much from that about your own upbringing, and how it helps you heal your own pain, you will also want to read about your narcissistic mother as a grandmother. I do invite every mother to read this, as it's essential that you know the tricks they can play even in this situation. Most people never even think of the possibility of narcissistic mothers. We have a huge cultural embargo upon thinking badly of mothers. We esteem mothers, put them on pedestals, worship them almost. I've read that this cultural indoctrination is why the fairy stories always feature wicked stepmothers - because to speak of wicked mothers is just undoable. I think there's a lot of plausibility in this theory. I'm writing this just a couple of days after Mother's Day and it'd make you sick, the sycophancy and adoration of mothers and motherhood that goes on. In my book You're Not Crazy - It's Your Mother (which is also part of the comprehensive package of my resources, the Mega DONM Resource Bundle) I speak of how this sycophancy is a third layer of abuse heaped upon us DONMs. The first two are directly from our mother herself, and then this one from society at large. It's no wonder, then, that with all the tricks and manipulations mothers with narcissistic personality disorder throw at us, that we as their daughters struggle so much.